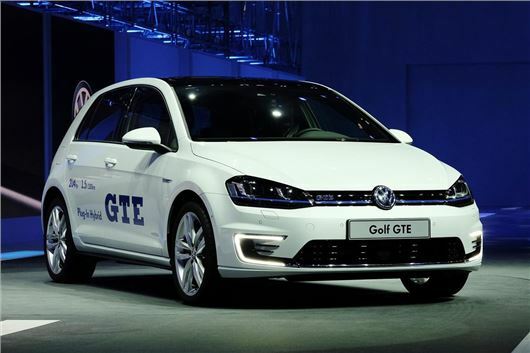 The Volkswagen Golf GTE, a plug-in hybrid, has been launched in Geneva at a motor show preview event. The GTE has been designed to combine the efficiency of a hybrid with the handling and all-round kudos of a Golf GTI. The figures are 0-62mph in 7.6 seconds and a theoretical range of 580 miles. The GTE's drivetrain is a combination of a 1.4 TSI petrol engine developing 150PS and a 102PS electric motor, although combined power is 204PS. Interestingly, the GTE is capable of 81mph on electric power alone. It's fitted with a six-speed DSG gearbox with a triple-clutch system. Of course where the GTE really stands out is in terms of efficiency. It emits just 35g/km of CO2 which obviously means zero VED and also exemption from the central London congestion charge zone. The claimed economy figure is 188mpg although these are always skewed by plug-in hybrids. The lithium-ion battery can be charged in around 3.5 hours from a standard mains socket or 2.5 hours from a wallbox. These are currently free through a government scheme. The front bumper of the Golf GTE has C-shaped LED daytime running lights along with a horizontal stripe across the grille and headlights, but in blue rather than the red of the GTI. The headlights, along with all lights on the GTE, are LED. It gets 18-inch ‘Serron’ alloy wheels as standard and the GTE will be five-door only. The interior features blue highlights where the GTI has red. This includes stitching on the steering wheel, gear lever and seats, plus a blue stripe in the tartan pattern on the sports seats. The 8-inch Discover Pro satellite navigation system with DAB radio and Bluetooth is standard and includes bespoke functions for electric vehicles, including showing range and electric charging points. It will be available to order in August with an expected price tag of around £30,000 after the £5000 government electric car grant.